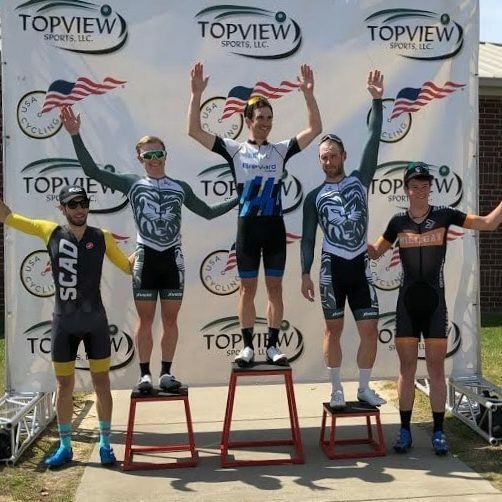 The Brevard College Cycling team collected several podium finishes after a successful two days of road competition on Saturday and Sunday at the Tiger Town Omnium hosted by Clemson University. The event was held Saturday in Central, S.C, with road races and time trials followed by Sunday’s Criterium races held in Anderson, S.C.
Scott McGill of Brevard College won the Men’s A Collegiate Criterium on Sunday, edging second-place finisher Dylan Cantrell of Piedmont by 1.1 seconds. He also registered a podium finish in Saturday’s Men’s Collegiate A Road Race with a third-place result. McGill completed the 65-mile event with a time of 2:40:16, 19 seconds behind race winner Fausto Crapiz of King University. Jason Marquardt of Brevard College earned two podium finishes in Men’s Collegiate D competition. Marquardt placed fifth in Saturday’s 26-mile, category D road race followed by a fourth-place podium in Sunday’s Category D Criterium. On the women’s side, the Tornados were also able to garner several podium finishes at the Tiger Town Omnium. On Saturday, Brevard College’s Hannah Arensman earned a podium finish with a fourth place result in the Women’s Collegiate Category A Road Race. Arensman finished with a time of 2:36.54.7 in the 53 mile event. In the tightly contested road race, Arensman finished just three seconds behind race winner Olivia Ray of SCAD-Savannah. Hannah Dickson of Brevard College finished second in the Women’s Category C Road Race with a time of 1:25.42, just 26 seconds behind race winner Marla Cline of Lees-McRae. Brevard College’s Audrey Cardwell and Samantha Munson placed fourth and fifth respectively in the race to give Brevard College three of the five spots on the category C podium. In Sunday’s Women’s Category C Criterium, Dickson finished less than one second behind race winner Kline from Lees-McRae to earn a second-place podium.